A month ago I was avoiding Punk records with a big stick; then as a favour I went to see Logoz play live and now I’m being inundated with the blighters; and some, like this one are re-kindling my love for noisy, angsty, shouty records. Hopefully this isn’t a mid-life crisis!! When the CD arrived I was intrigued by the contradiction of the bands slightly offensive name and the Press Shot of four fresh faced teenagers mugging at the camera, but then again photos like that normally accompany News footage of atrocities at some High School in Nowheresville, USA. 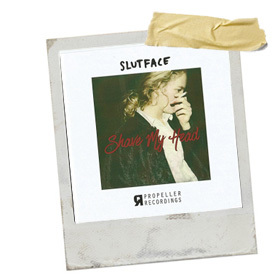 Slutface are three parts Norwegian and one part American, with singer Haley Shay coming from said, Nowheresville USA. The boys know their place; and create a mighty powerful sound of crashing guitars and heart squashing bass and drums in the background; but they know not to try to steal her thunder…..or else. B-Side Get My Own owes more to the halcyon days of British Punk Rock; and you can sense the quartet’s snarling as Haley directs her venom at anyone and everyone who may get in her way. Nowhere near as raw as the originators of Punk; but as they don’t look old enough to even remember the first Green Day album; Slutface show all the hallmarks of a band going somewhere with their well played and well produced debut single. “Oi will give it foive!” (Ask your Granddad).